I never thought I would be a mother. Even as a child, teenager and young adult I could not visualize myself as a mother. I just didn’t want kids. This was compounded by my views of family and home from my own formative years. My parents were Christian missionaries overseas for most of my elementary and middle school years, and when we were home, they stayed heavily involved in work at our church. I grew up feeling that my sister and I were mostly just in the way of them accomplishing productivity in their true calling. At some point during my childhood my parents’ absence left an opening for a predator, and the years of molestation I endured went completely unnoticed. Between the limited amount of time my parents had to offer tangible love, and being sexually abused from such a young age, I grew up not understanding what a true loving touch was without being sexual. I think that this also fueled my desire not to have kids, as deep down inside I feared that perhaps I might offend someone else. Instead, I had plans for my life and career ambitions. I was going to be a veterinarian or doctor someday. When I started dating my husband, a man I had practically grown up with, he also shared my views on kids and supported my goals of education and working a rewarding, productive job. I threw myself into my career, as used it as a way to escape coping with my traumatic past. It wasn’t until I went to nursing school that I first began to learn about healthy touch. As I practiced taking care of others in hands-on ways, it creaked open a sealed door in my heart, allowing me to glimpse a nurturing side I never thought I had. It was rewarding work being a nurse, and then moving into pediatrics, looking out for others. Not only with the children in my care, but through the relationships I forged with their mothers, teaching and mentoring them how to care for their babies and have confidence in parenthood. After a few years of marriage and working in a successful a career, life still felt a little empty. I needed something more. Something that was not just all about me. My husband and I talked about it, and we decided to try foster care, just to see how it went. Everything we had been told led us to believe that each case would be in six months increments, and then we’d have a break. It sounded perfect. We could do a trial six months at first and see how it went. But six months turned into eight years with the same sibling group, and we have since adopted a little girl through the foster system as well. I think that sometimes God truly uses our naivety to get us in the end. Being a foster parent has been way harder than I ever imaged it would be, but it has also been more healing than I could have ever dreamed! It gave me the connection I never had growing up, and filled my once-hollow days with the tangible love that only parenting and family can bring. Even though I was learning love, connection and attachment from being a foster and adopted mother, the trauma from my childhood and the issues it caused in my marriage unfortunately began to take their toll. On the brink of divorce, I made the decision to leave my very successful nursing career, walking away from it without looking back and with no regrets. For the first time in over ten years, I stayed home every day with our kids. 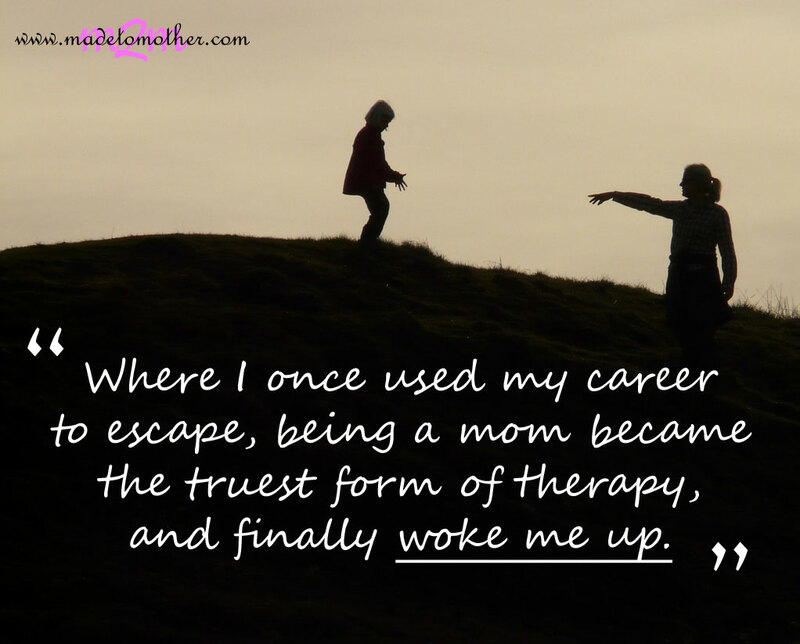 Where I once used my career as therapy to escape, being a stay-at-home mom, combined with seeing a professional for the hurts in my past became the truest form of therapy, and finally woke me up. Two years later, although I couldn’t save my marriage, I gained so much more from motherhood than I ever had before. Where I once thought I would never be a mother, parenthood has now become the core of my life. Being a mother is my passion and my greatest joy. Finally, I have learned what true attachment is, and even if it means being a single mom, I can now be a healthier example for my children. The author to this story prefers to remain anonymous, but I think she presents a wonderful opportunity to talk about how mothers come in all sorts of shapes and sizes. Christian, atheist, biological, adoptive, foster, single, married, divorced, healthy and broken…. There is no judgment or condemnation here; just support. And hopefully, there is also healing. Healing in sharing our stories, our traumatic pasts, our confessions. Healing in feeling camaraderie with others who’ve been there, too, or are there right now. And the strength to move forward toward a healthier future. Can you relate to this mother? Is there trauma you need to work through? Have you experienced ways where motherhood has been a form of therapy for you? A very interesting story, and one I’ve heard a bit lately about parents leaving their children to do missionary work. I’m not sure that’s the way God intended it at all. Thank you for sharing this story. For giving this woman a place to share her story without fear of repercussions. Such a powerful testimony of how God can heal our past hurts if we only allow him access to our heart. There is certainly a God-given drive in me to be for my kids what I would never attempt to be if I didn’t love them so much. I’m so sorry that you experienced sexual abuse as a child and that your parents were so devoted to their ministry that you felt left out. I can relate to the latter of these two, since my dad was a workaholic pastor. It’s a delicate balance that must be struck when ministering and since my hubby is a pastor and I’m heavily involved in ministry at my church, I’m not sure we’ve always struck it. I also can relate to your situation as a foster mom to a degree. We fostered for six months and then for various reasons that time in our life came to an abrupt close. It was some of the hardest times of my life. The girl we fostered brought up so much baggage I had from my own past that I’d never really dealt with until she was around–which is saying a lot since I am a counselor and have dissected and processed my baggage for decades! I am so grateful that you’ve worked through all of that and found mothering to be a joy. You’re story is very inspiring, Wynter. Thanks for sharing what probably has been somewhat painful to talk about. Though my story is completely different from yours, I have definitely experienced some healing as a result of motherhood. Being a mom is like an emotional wake-up call at times, showing me Truth that I’ve missed or ignored before. Thank you for being brave to share your story here. And thank you, Wynter, for linking up to Works for Me Wednesday! I do hope that missionary societies have learned to offer home school materials to missionary parents. Those who send their children off to “Christian” boarding schools have often reaped the consequences of severed relationships and in many cases abuse of various kinds. Not all missionary kids are Christians, and this separation can hurt during the years they needed nurturing. I am glad that this mother did get some counseling help and that they emphasized the need to forgive the tormentor. Thank you for sharing this story with us here at Tell me a True Story. What a beautiful story! I think motherhood teaches all of us things that we could never even imagine. I’ve had to learn to throw perfection and strict schedules out the window – and I’ve even come to embrace being just good-enough. Thanks for sharing at the Thoughtful Spot! 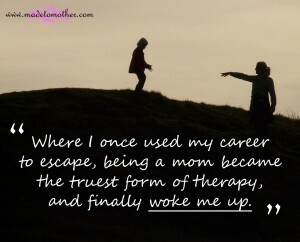 “Where I once used my career as therapy to escape, being a stay-at-home mom, combined with seeing a professional for the hurts in my past became the truest form of therapy, and finally woke me up.” That’s been my experience too. God gives us so much grace. Thanks for sharing. Wow, what a courageous woman to share such a story. I am so glad you finally found peace (as best as you could) and found something to make you happy. Thank you for sharing your story. I blog as my form of therapy! Wow, what a story. My heart goes out to her. I agree, having kid(s) is definitely therapeutic. Thanks for linking up with Thursday Favorite Things! Hope you’ll join us again this week.